The Santa Barbara District Attorney’s Office is working to extradite actor Randy Quaid and his wife Evi Quaid to face charges of felony vandalism. 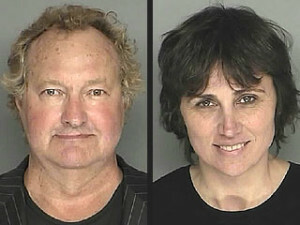 In 2010, the couple fled to Canada after they were charged with breaking into a Montecito home they previously owned. The Quaids are accused of causing $5,000 worth of damage. Randy Quaid had battled to stay in Canada, claiming he was being hunted by “Hollywood star-whackers” who he said killed his friends David Carradine and Heath Ledger. Canadian officials had planned to deport Randy Quaid on Oct. 14. Rather than wait to be deported, the Quaids attempted to cross into the United States last week. On Friday, the Vermont State Police arrested the pair as they attempted to cross into Vermont. The Quaids are being held on $500,000 bail each on California warrant charges of felony vandalism, misdemeanor, trespass, and felony failure to appear in court. On Monday, they are scheduled to appear in a Vermont State Court. Seems like dirt bags have become a fashion statement. Remember to politely greet eligible parties when acknowledging them, “hello dirt bag”, have a lovely day. Canada seaports washed up actors who break into their own homes back to America. The US doesn’t deport murderers and people who break children’s bones. Back to Mexico. What is wrong with the fools running out country? I hope the two can have a wonderful Christmas this year! Too bad they made it back in, the US doesn’t need these two. Canada screwed up my letting this nut job in 5 years ago, but like the Terminator…he’s back. He and Evi are certified whack jobs who suffer from some kind of severe schizophrenic paranoia that prevents then from grasping reality. Hmmm…they’d make great CSD candidates. The Prosecutor’s Office recently discovered the Quaids’ have managed to accumulate enough wealth over the years to more than cover the extradition expenses. You should post the most recent pic that was in the Ragbuine today. Randy looks like a wild and wooly beast! !